—Push loves the snow, Zula not so much. ZooBoo is doing great. However, she does not like the snow or perhaps it is the cold. She goes about two feet off of the covered patio to do her business and then comes right back in. Push on the other hand loves the snow. We have been outside playing fetch in it four times already this morning. Push and I are on temporary hiatus from formal obedience training. We will pick the formal training up again hopefully in the spring. Waiting for me to throw the ball. We are happy to know that both Zula (ZooBoo) and Pushkin (Push) are doing well. At least one loves the snow–well, and Zula gets off the deck even though there is the white stuff everywhere. ~ Roxy Loves it –Sage is a No Go! Sage hates the cold wet snow. She poops and pees 4 feet from the bottom of the steps then stands at the door and barks! At least she doesn’t pee on the deck. We’ve had dogs do that when there is snow! Cooper is our other than Weim rescue–Roxy’s playmate. Winchester woke up like it was any other day this morning until he went outside to go potty. There was this strange white cold powder covering the ground. He was unsure what to think about this so he slowly walked into what he learned to be snow. Winchester realized the snow was fun so he started running around in it. Mom even tossed a couple of snowballs at Chester he had so much fun. Now he is warming up on the couch curled up next to his mommy taking a nap. Whitney–thank you, for thinking of us with this special update. It is greatly appreciated. Above are some adorable photos of Misty in the snow recently, here in Southern Oregon. She loves running as fast as she can through the snow. After she charges through the snow, she likes to take a break on the couch to get a tummy rub. I really enjoy noticing the different hereditary traits that are passed along with your certain lineages. It seems like Misty(Mousse X Benton) has smaller ears and a thinner face, which is just so cute. 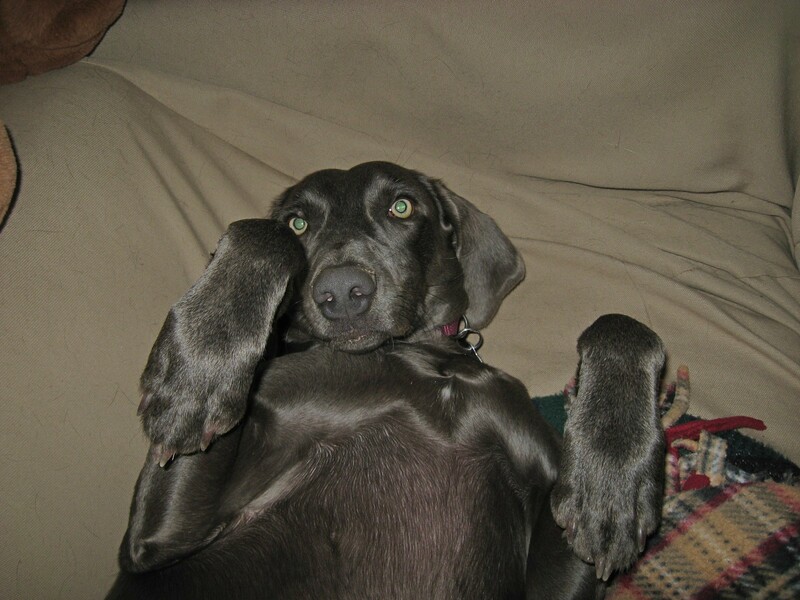 But, of course I also love our other Weim, Sky, that has a broader shaped face–as you know she resides with my brother’s “X”; I don’t remember her lineage. 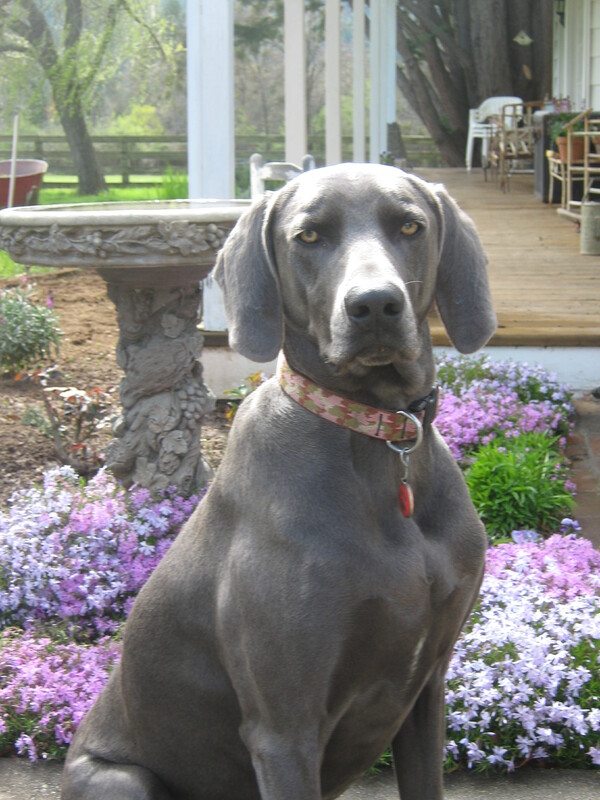 Breeder’s Comment: Thanks Shannon for taking the time to update us on both OwyheeStar Weims. We are glad they are much-loved, and well cared for in every way. There are differences, and sometimes when the DNA weaves through you get variances. The Weimar face is endearing (wide or narrow). They are all capable of etching forever memories that keep us laughing long after they depart our life. People get caught up on a certain look, but it seems to us the temperament and health are far more important.